Sophomore Sabrina Ryan and first-year Emily Moll pitched gems for the Diplomats on Tuesday, April 9 against Immaculata University. Ryan recorded her first shutout of the season, allowing the Diplomats to secure a 4-0 victory in their first game against the Mighty Macs. The bats were quiet for both teams throughout the first three innings. Ryan struck out four out of Immaculata’s first nine batters. The bats came alive for the Diplomats in the bottom of the fourth inning. First-year Sam Martin started the inning with a scorching single up the middle. First-year Abi Buell grounded into a fielder’s choice for the first out. Junior Lexi Piccinich kept the rally going with a single up the middle, advancing Buell to second. Sophomore Hannah Salvucci busted the game open with a double to right field, allowing Buell to score and Piccinich to advance to third. After a foul out for the second out, Ella Glenn hit a rocketing line drive into the left-center gap, allowing Piccinich and Salvucci to score and giving the Diplomats a 3-0 lead. Ryan shut the Mighty Macs down in the top of the fifth inning with a strikeout, flyout, and foul out. The Diplomats notched another run in the bottom of the fifth inning. After Martin reached on a fielder’s choice, Buell hit a deep shot into the right-center gap, allowing Martin to score from first. The Diplomats pressured to score in the bottom of the sixth inning. Salvucci started the inning with a single to right field. First-year Caitlyn Erdman reached on a fielder’s choice. Glenn and first-year Shannon Briggs both had great at-bats, each earning a walk to load the bases. However, the Diplomats were unable to capitalize on this opportunity. Ryan got the three batters out, one, two, three in the top of the seventh to secure a 4-0 victory for the Diplomats. 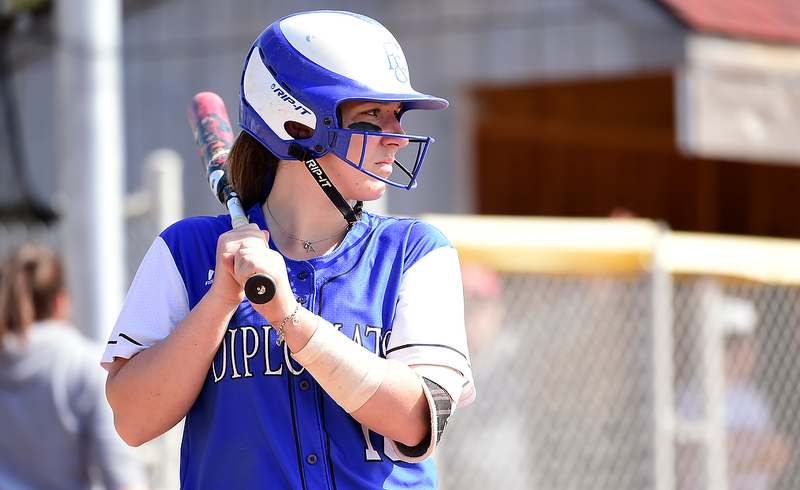 Piccinich and Salvucci had a day at the plate for the Diplomats. In the second game, Piccinich started a rally for F&M in the second inning with a double to right field. Salvucci followed with a single through the 5-6 hole, which allowed Piccinich to move to third. Erdman came in clutch with a single to left-center, scoring Piccinich. First-year Taylor Hudson continued with a single down the right field line, allowing Salvucci to score and Erdman to advance to third. First-year Caitlin McCarthy executed a squeeze play, dropping a bunt down to allow a sprinting Erdman to score from third. After a groundout for the second out, first-year Jamie Belfer reached first on an error by the left fielder to allow Hudson to score. At the end of the inning, the Diplomats were up 4-0. In the top of the third inning, Moll got all three Immaculata batters out with a groundout, popout, and strikeout. Moll was able to retire the first nine batters of the game without allowing a hit or runner to reach first. The Diplomats tacked on two more runs in the bottom of the third inning with a string of hits from Buell, Piccinich, and Salvucci to make the score 6-0. After a single from Buell, and a double from Piccinich, Salvucci knocked in both runs with a deep line drive to left field. The Mighty Macs were able to string a few hits together in the top of the forth. After two singles and a stolen base, the Mighty Macs were able to score one run off of a sacrifice fly to right field, to make the score 6-1. The Diplomats scored three runs in the bottom of the fourth inning to gain a 9-1 lead. Senior Christine Miles started off the inning with a walk. Belfer singled to left, advancing Miles to second. Martin layed down a beautiful bunt to load the bases. Piccinich cleared the bases with a double to the center field fence. Moll got the first two batters of the fifth inning out. After a giving up a single, Moll got the final batter to fly out to right field, securing a Diplomat 9-1 victory after five innings. The Diplomats improved to 10-12 on the season after these two victories. They will face-off against conference competitor, McDaniel, at home on Saturday, April 13.